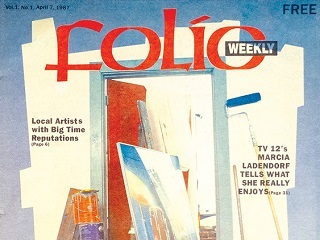 Tricia Booker revisits her experiences at Jacksonville's Folio Weekly. As print journalism has shook, shimmied and rolled, it’s safe to say Tricia Booker has made a career progression that affords her a uniquely powerful venting mechanism. The one-time staffer at Jacksonville, Fla. alternative newspaper Folio Weekly is today a boxing instructor. Based in Ponte Vedra, she also teaches writing and cares with her husband for their three teenage children. John Citrone had originally applied to be a news writer, but in the arts and entertainment world, he found his niche. As the city’s arts scene emerged from obscurity, John worked to keep new artists rising and cultural events relevant. We thank Booker for a Fred Durst anecdote that has nothing to do with Robert. And urge you to read the full article. Like a balmy Florida summer breeze, the piece conjures up a warmer time in print journalism. One that the pace of the Web and the ubiquity of Smartphones have today almost completely eradicated.